Before I begin this, there is something you should know, if you do not already. I’ve put in quite a lot of miles on my road bike (which I’ve had for a year today!). Riding on the eastern side of the Hudson is pretty awesome. Well, so is the riding across the river. Meh, everywhere I’ve ridden on the roads have been nice (except for route 9 from Hudson to Rhinebeck which is a pot hole mess with no shoulder). My mountain bike is a different story. Truth be told, I think I’ve put in less than twenty five on my mountain bike. I think twenty-five is stretching it. Maybe more like eight, and two of those were on a road. Do I let that stop me playing? Pshh, please. You’ve gotta learn how to handle the bike somehow, and what better way to learn how to do that than by 1) riding by yourself in 2) a completely foreign place (okay, okay a different state). Yes, you may know my special bond with my road bike. But after this weekends occurances, I think my bond with my mountain bike might be even closer. I returned from my whirlwind vacation of being in New Hampshire, NYC, and Vermont, and have decided to tell you about it. Might I add, this is the first vacation I have had in over a year, and the first time I have driven anywhere by myself as the driver for a longer distance than kingston/New Paltz to Boston, which, once upon a time, could do blindfolded with one hand tied behind my back. Don’t worry, I never actually did that. I try to obey the law as much as possible. I headed out early (0600) since I was up at 3 and got to my first destination, Easte Burke, Vermont, known for it’s amazing network of trails for mountain biking known as the Kingdom Trails. Now, I’ve never been to this place, or this area of Vermont before, so it was all new to me (just like in NH, gas prices are way cheaper than in Dutchess County) I would have made it sooner had there not been so much road work going on. Left lane closed—-merge Right—right lane closed—merge left. Seriously? on I-90 going up to East Burke there was construction construction construction. Which was slighly annoying. But, with it being that early in the day, it wasn’t too bad because not too many people were on the roads. After multiple cups of coffee and iced coffee to keep me awake, and munching on a Molly trail mix of almonds and dried cherries (which look like cranberries dried, who knew? ), I made it to Burke Mountain to find that the lifts were only open on weekends. And, I think Burke Mountain is where downhill bikers go. Anyway, after getting lost, I found my way to the Kingdom Trails Information Center and discussed options for biking. “Welcome! Have you ever been here before? 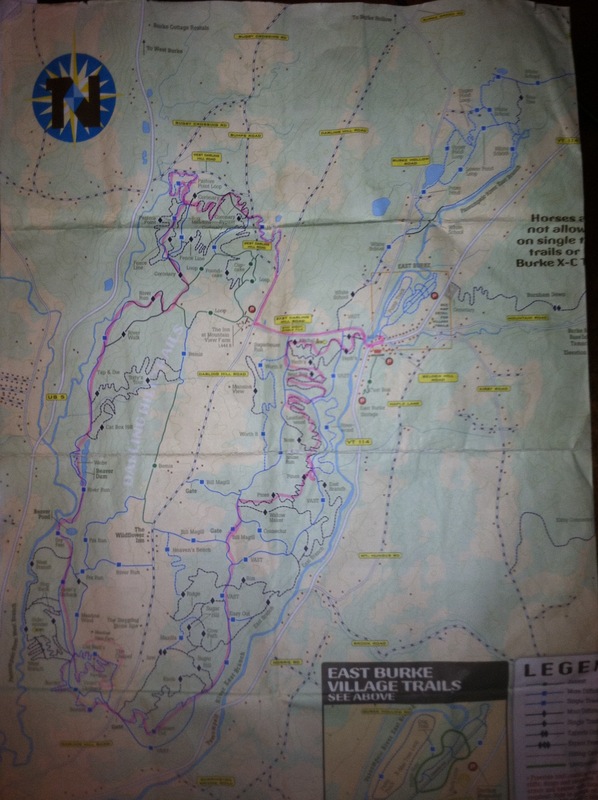 Hmm, maybe I should tell him that even though I live close to the Catskills, I’ve only ever been on my mountain bike less than 5 times….The very friendly man behind the desk pulled out a very detailed map will miles and miles of different mountain bike paths, ranging from “easiest” to “most difficult”–most of what he showed me was single track paths. Trails, trails, lots of trails! If you are unfamiliar with Kingdom Trails, and like mountain biking, this place is amazing and you could spend days riding all of the paths that they have. There is not only cross country mountain biking, but downhill mountain biking over at Burke Mountain, which I mentioned before. If I did not need to use my limbs for work, then I totally would have tried a downhill mtn bike course they have for people. My response: Yeah, I love going fast! *As a side note, yes, I have this weird ability to be able to talk to complete strangers which some people find odd since I’m somewhat shy. These two guys were on vacation from Seattle! It was nice to have some other people to ride with, even though at a point I had to part ways with my newfound friends. 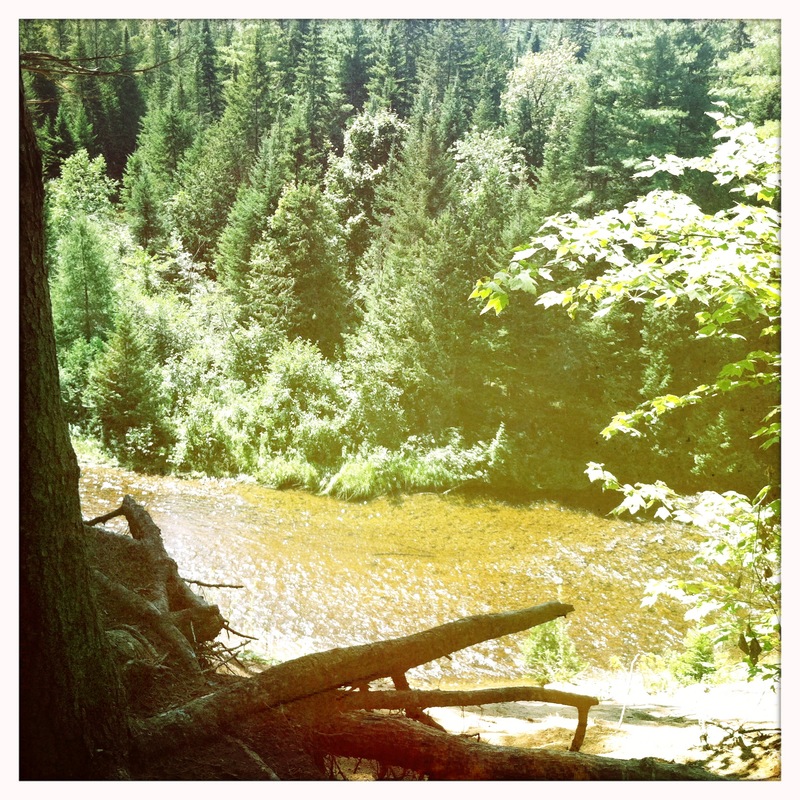 I continued my journey biking up through trees, over bridges (which I didn’t fall off of! ), speeding down hills,through streams, through puddles of mud, and getting lost. It was a blast, and I wish there was a place like this closer to Rhinebeck with trails like them. After spending a couple hours of biking, I was famished and covered with mud. I kind of washed enough of the dried mud from my legs and headed into Lyndonville for food before heading to my next destination: Stowe, VT. For some reason, after any bike ride, I crave food that I do not usually eat, like pizza. And at the end of this ride I thought, Mmm, pizza and a beer sounds really good right now. Alas, I got to a pizza place right in town (there isn’t much in Lyndonville, just incase you were wondering) only to find out they had stopped making pizza thirty minutes before I got there, and they would not start serving it again for three more hours. First of all, what type of pizza place doesn’t have pizza all the time? Ohh well, the Molly trail mix and gatorade in my car would have to do. I looked down at a map and decided I had had enough of being here, so onto the next stop before heading to my final destination of Burlington. 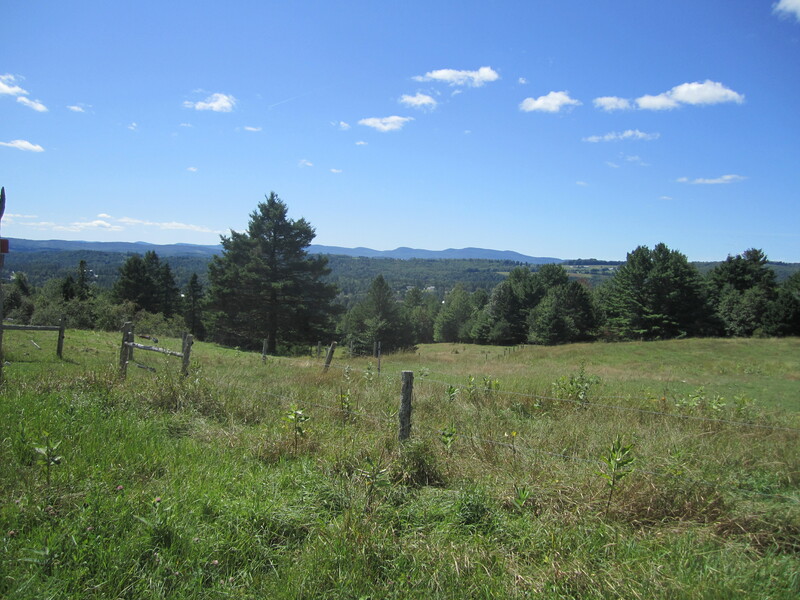 Stowe, Vermont, is about an hour and twenty minutes east of Lyndonville. It is home of the highest point/mountain in Vermont. Since I had come prepared with not only my mountain and road bike, but also hiking gear, I figured I would do some hiking/walking if the weather permitted. Once I got to my B&B that I was staying in, which was a very cute , I went and walked the Pinnacle Trail– which was a little more than 2 miles walk outside the village to the trail head, and then a 1.4 mile hike to the summit of Pinnacle. The weather could not be more gorgeous, and this was a perfect afternoon/early evening hike. 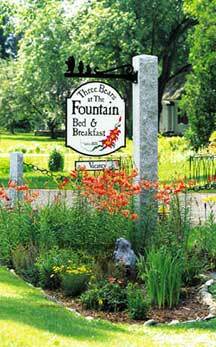 Stowe's most romantic and historic bed and breakfast. After a hearty breakfast the next morning (they had great great breakfast) I decided to hike up the Long Trail– a trail that will take you to Mount Mansfield, the highest point in Vermont (4395 ft). I went up Smugglers Knotch and got to the summit in the early afternoon. I was amazed at how many hikers I saw along the way. There were some areas which were a bit tricky, but for the most part, it wasn’t that difficult of a hike. And the views from the top were amazing! And with a clear, cloudless blue sky, you could see for miles. Ofcourse, the one time I forget both my camera and my phone. I guess I’ll just have to go back! Previous Vacation, here I come! Next Are Those Bruises? Sounds like you had a great time…I was wondering what was going on in your life..
We were in Meredith , NH a couple of weeks ago. We were visiting friends that have a place on lake Wicwas . We have been going up there since 1968. I think Aunt Pam was pregnant with Wendy the first time we went to visit these friends. I told you you’d LOVE it!!!! It was awesome. Vermont is the best! 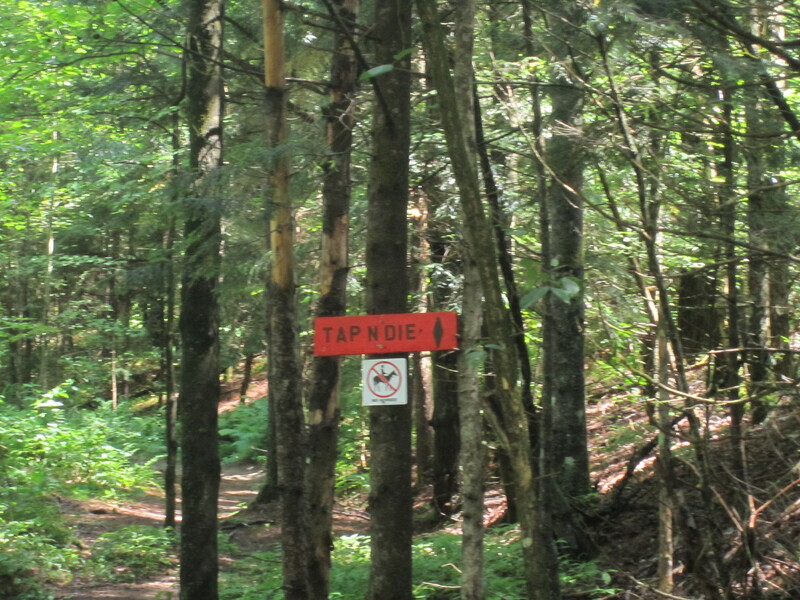 Good people, good cheese, good ice cream, good beer, ahem, beverages, good trails for everything! Your great experiences brought back memories of me as an 11th grader, at Warren Witherell’s ski camp (Burke Mt Alpine Training Center). My challenges were no where near as intense, as the ski lift was up and running. Look foward to seeing more photos of this beautiful corner of the world in Oct.